Are You Frustrated That You Aren't Getting As Many Orders As You Had Hoped For? Do You Want A NO COST Strategy For Getting People To Buy From You? For More Than A Decade I've Been Using Free Content To Get People To Come To My Website And Buy. For The First Time Ever, I'll Show You Everything I've Been Doing So You Can Put It To Work For You! I really enjoy visits to the local grocery store chains here in my home town. That's why I go to the store. 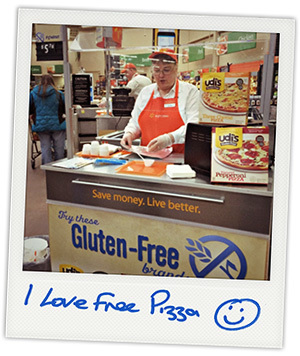 To get free samples of cookies, brownies, cakes, cheeses, crackers, meats, chips, dips and so forth. There is always something new to try and we can't get enough of them. Good times! Of course, these stores give away the free samples not simply to be kind or as a way to give back. They give away free samples to get you to try something. They give away free samples to whet your appetite. They give away free samples to convince you to buy more. That's the gameplan in a nutshell. They want to move people from "try" to "buy". Ultimately, the purpose of giving away free samples is to get sales. To convince customers to pick up a package, box or bottle and put it into their shopping basket. The bottom line reason for doing this is to make more money. Josh and I routinely respond to these free samples in one of three ways: we say "no", "maybe" or "yes". That is, some of the free samples do nothing to make us want to buy more. Other times a free sample is good but not something we act on immediately. Then, there are those rare occasions when we eat a sample, think "we absolutely must have more of this today" and pick up a carton or container to buy immediately. They want us to buy the product. That's why they give us a free sample. They want us to enjoy it so much that we simply must have more of it. That's how they make money. The question is: is it possible to move people from "no" to "maybe" to "yes"? Said another way, can people be moved from "try" to "buy", from "free" to "fee"? Yoda famously said "Do or do not, there is no try." The point being, either you accomplish something or you don't. There really isn't a third option here. When grocery stores give away free samples - and you and I give away free content - in order to persuade people to spend money, then people will either buy or not buy what we are attempting to sell. Our freebie either accomplishes its intended purpose or it doesn't. It's not enough just to give away free content. Listen, not all free content accomplishes its intended purpose. In fact, truthfully, most does not. I've been in this business for fourteen years and I have seen an untold amount of free articles, reports, blog posts, podcasts, webinars and so forth. Most of which does absolutely nothing to convince people to buy. In fact, it often does just the opposite. If I were forced to give a percentage, I would guess that 95% of free content does nothing of significance to get the reader/listener/viewer to buy a product or service. The overwhelming majority of free content does not produce sales. It does not make money. In a sense, it is a complete waste of time and effort. In fact, it can be counterproductive...actually convincing people NOT to buy. Then there is other free content that provides quality information in a professional format. It's good stuff, maybe even great stuff. But it really doesn't do much to get fence-sitters to take action. It produces a "maybe". Maybe sometime in the future I'll click a link. Or take a closer look. Or consider a purchase. Maybe. The problem with maybe is that its twin sister is "maybe not". It could go either way in the future. Finally there is that rare breed of free content that whets the appetite. It does an effective job at preselling the reader/listener/viewer on a specific product or service. It persuades people, in whole or in part, to make a purchase. It accomplishes its intended purpose. Money is made. This kind of content gets the most results. There is no method that produces 100% conversion, but this kind of content helps you get closer to that number. It's not enough to just give away free content. It really isn't. Think I'm wrong about this? Drop by your favorite article bank and read through the first ten articles you find. Or spend thirty minutes sampling from throughout the article bank. Let me know what you find. Do you find yourself camped out in group one? Are you satisfied with your fingers-crossed in group two? Would you like to be a part of the select group three? As you look at that list, do you see any items that you have personally created? I don't have a crystal ball, but I'm reasonably sure I just saw you nod your head up and down in an affirmative motion. You almost certainly have created at least one of these. Most people in internet business have published content in many of these formats. It's not that people aren't accustomed to giving away free content. They just don't know how to do it with much success. What I want you to understand is this: you are already doing what I'm going to suggest that you do. I'm just going to teach you how to do it differently so you can move from "group 1" or "group 2" up to "group 3". And the way we're going to help you switch groups is to teach you how to move potential customers from "try" to "buy". SIDEBAR: If you have never created any kind of free content before, don't worry. That is actually a good thing. You won't have to relearn anything - you can do it right from the very beginning! That is, you want your free content - in whatever format you distribute it - to help convince people to buy a product that you recommend. You want to whet their appetites. Create hunger. Convince them to fill up their shopping cart with them. Stir things up so that they can't get enough. 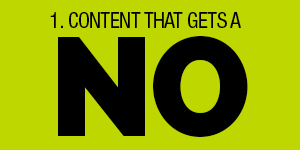 Move People From "No" to "Yes"
The idea is simple: give away free content in order to presell people. That is, you give away free information, that shared knowledge or experience you possess, in such a way that it persuades, in whole or in part, other people to buy something. When your free content is created correctly, it, in essence, creates movement. It's like an usher at an event - it leads people to their destination. In this case, your sales page. Your product. Your order form. to get people to your sales page hungry. The free content piques their interest. It whets their appetite. It makes them hungry. They want more. What happens next? They click on a link or type an address into a browser and they go to the webpage of the product offered to take a closer look. And they arrive already hungry. The logical outcome for many of them will be to order the product. Good free content increases website traffic (gets more people to click through and investigate) AND increases conversion of website traffic (aids in the sales process by creating interest and hunger). Good free content gets you to try something. Good free content whets your appetite. 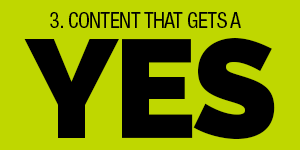 Good free content convinces you to buy more. I'll say it again: it's not enough just to give away free content. Your content needs to be a useful and effective tool in the process of getting people to buy. If you're going to put the time and effort into writing your content, why not get the greatest possible benefit from it? So, when you give away a free article or small report or webinar or podcast episode or any of a dozen different types of free content, you want to bring your A-game. You want to do the same thing, but in a different way. With a different result. 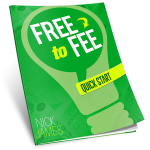 The FREE TO FEE System. If you don't know me already, my name is Nick James and I've been making a living online since 2001. In fact, it was back in 2001 that I first used free content to convince people to buy my product. During the 14+ years since, I've continued to use the same system! This report was downloaded tens of thousands of times and was responsible for building me a huge mailing list that kickstarted my business. There is no way for me to say for certain, but I would conservatively estimate that this report was single-handedly responsible for over $100,000 in profit for my business. In the interest of full-disclosure, I had NO IDEA what I was doing back then. It was a complete shot in the dark when I put that report together. I read no courses, consulted with no coaches, followed no guidelines. I just created what I thought was a compelling piece of free content and made it available. People loved it. And people responded to it. They were successfully moved from "try" to "buy". From "free" to "fee". As I began to look at why that report was so successful, I began to notice some things about free content. I started experimenting to see if I could duplicate the success. Some things I released were duds and some were hits. Throughout that experimentation, I began to see a pattern forming for how to use free content to help persuade people to buy. And for more than a decade I've been using an unpublished system for creating free content that converts. For the first time ever, I've put together a special training presentation that teaches what I've been doing all these years. 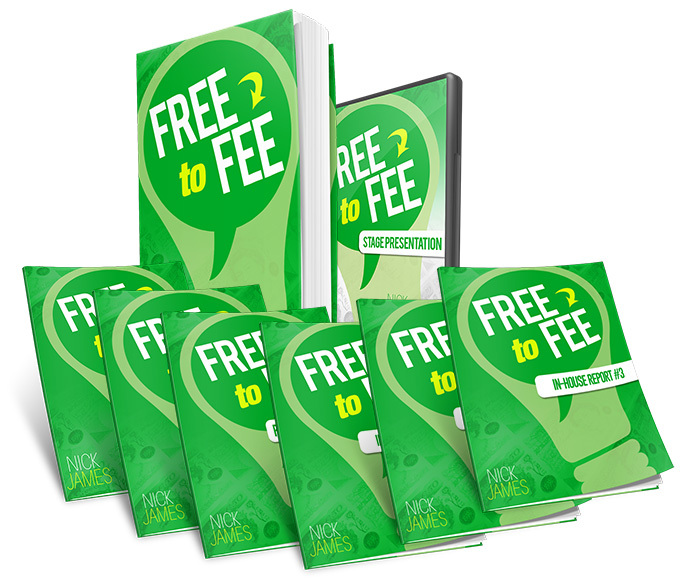 I've entitled it The Free To Fee System, because that's the aim of the training: to teach people how to create free content that leads to a paid purchase. IMPORTANT: This is a no-holds-barred, highly intensive TWO HOUR video presentation. 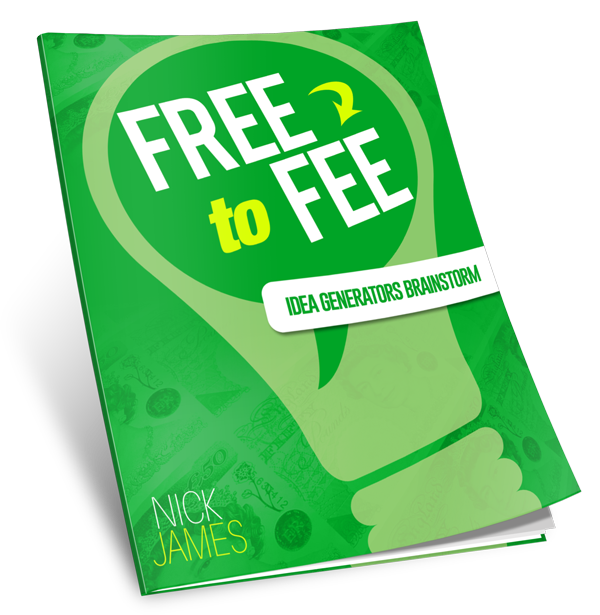 It is filled with dozens of ideas, insider tips, steps and real life examples. To my knowledge, there is no other training quite like this. There is a BIG difference between free content and free content that converts. In this opening section, I reveal the ONE strategy I've used for well over a decade to convince people to buy from me. You'll discover how to build trust, warm up the prospect, and initiate the sales process, effectively moving people from "free" to "fee". This is the most effective strategy I've ever seen for getting people to respond with "yes" instead of "no" or even "maybe". The beauty of the strategy is that there are many different ways to put it to work for you. This gives you a tremendous amount of options, making it extremely easy to actually do it and see results. In this section I'll explain the seven best models for using free content to help convince people to buy from you. Featuring specific insider keys to success and real-life examples, each of these will be taught in my usual "make-sure-they-understand" style. In some ways, this is a "condensed" version of section three, stripping away all of the details to present the system in an easily digestable checklist. But, there is an incredibly important "tweak" that I share here that raises the stakes tremendously. We'll look at three steps for using the system, but we'll do so in such a way that it practically "forces" people to buy from you. I won't say too much about this - you'll have to see for yourself, but it's a game-changer. Our training closes out with a bang as I share three really solid ideas for taking your free content to the "next level". You'll discover how to promote multiple offers simultaneously, how to get people to read/listen/watch your free content and how to put it all together to create frenzied activity. In this final section I'll share my biggest success story in using free content during the past 14+ years and exactly how to use that strategy for your own business. This is one of the most intensive training sessions I have ever completed. And that's saying a lot. I'm well known for really delivering detailed, step-by-step information with lots of relevant examples. To that end, this training presentation is at the top of the mountain. It's jam-packed. Just completely jam-packed. But in a way that is easy-to-follow. When you starting watching it, in a few minutes, you'll see why I've continued to use the system over and over again for my entire internet business lifetime. There's no reason why you can't put it to work for you as well. I'll Supply Training, Resources And Even Coaching! I know, I know, this all sounds great, right? Like I said earlier, you're not going to do anything differently than you are already doing. You're going to do the same things you are already doing, in a different way. For greater results. I mean, who in their right mind wouldn't want greater results from the same effort??!! Think about that for just a moment and let it sink in. You're going to write articles anyway, so why not get greater results? 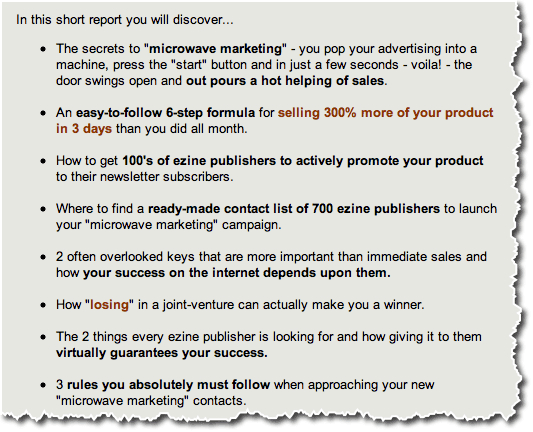 You're going to publish a newsletter anyway, so why not get greater results? You're going to give away small reports, so why not get greater results? You're going to post on blogs anyway, so why not get greater results? You're going to host webinars anyway, so why not get greater results? 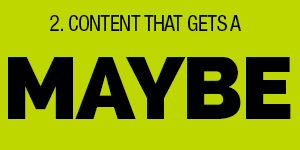 Whatever it is that you do to give away free content, you're going to continue doing it. So, why not do it a little differently using my system and do it more effectively than you are now? That's why this training is so important and is such a no-brainer. You'll simply be doing a better job at the things you're already doing. That's basically what this course is about. It teaches you to say things differently for a better result. You're going to learn how to do what you're already doing in a different way. Now, I know where you think we're going next. This is the part of the salesletter where I'm supposed to give you about fifty bullet points of all the reasons why you should order this training course. In fact, that brings up an important point: you do NOT have to resort to mind games to use this training to convince people to buy from you. You can be very persuasive without overselling things. EXAMPLE: Imagine this: you drive to a department store parking lot, setup a collection booth for a toy drive at the entrance to the store and stand there for six hours asking people for donations. If there was a way to get more people to donate toys by using a specific way of saying things, wouldn't you want to know about it? I mean, you're still gonna drive to the store, setup the booth and stand there for hours -- the steps are the same. Why not say things differently for a better result?? So, I'm not going to oversell things here. Or make outlandish promises that I can't keep. Or tell you about bazillions of dollars that you're gonna make by dinner-time. 1. What exactly needs to be in your free content to get people to invest in your paid product. 2. A three-step process for creating free content in a variety of formats that you can understand. 3. 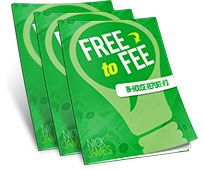 Seven proven effective models for moving people from "free to fee" to pick from. 4. Example after example after example to make sure you "get it" as you go through the steps. 5. How to use your content to eliminate "excuses" for not buying before they are even given. 6. Little tweaks, variations and keys that I have discovered in fourteen years of using the system. 7. 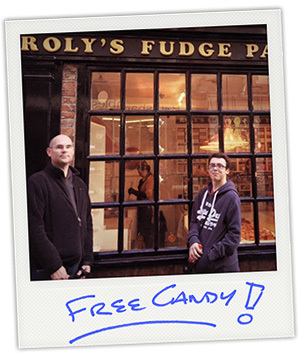 Three "advanced" tactics for using free content for even greater potential results. 8. The #1 way to get people to actually read your stuff so you can get them hungry for more. 9. Effective ways to connect your free content with a paid product in just a few sentences. 10. How to do what you are already doing anyway in a slightly different way for increased response. This works for your own products or other people's products that you promote through an affiliate link. It works for creating content for articles, blog posts, webinars, reports and virtually any kind of free content. Again, I'm not going to oversell this. There really isn't a reason to do so. You either agree that this is an invaluable training or you don't. Free content helps build a "trust" relationship with the consumer which is required in order to generate sales. People don't buy from those they don't trust. Free content gives the consumer a risk-free opportunity to "taste the free sample" and you an opportunity to convince her that she needs to keep eating. Free content exhibits good will and creates a sense of loyalty and even indebtedness. The law of reciprocity intimates that if you do something for others, they will do something for you. Free content can be shared by others through retweets, blog posts, emails and so forth. Ultimately, your information can reach people you could never reach on your own. Free content allows you to establish credibility and "prove your worth" by showcasing quality information. If others find it beneficial, then they will turn to you as a source for more. Free content is the first step in your sales process - converting "browsers into buyers" begins well before they are presented with your salesletter. Done right, they arrive at your salesletter hungry! I could give you a lot more reasons, but I won't. You get it. Maybe you're thinking, "Nick, this is fantastic - how much money do you think I can make?" I have no idea. I won't even begin to speculate. I don't know you. I don't know your market. I don't know subject matter. I don't know anything that would allow me to evaulate how many orders you'll produce or how much money you'll make - or won't make. I get it that you are accustomed to people stuffing you full of financial promises like I get stuffed full of cheese and brownies on Saturdays at Walmart, but that's not gonna happen here. What I will tell you is this: I will teach you how to create content that helps persuade others to buy. Then, it's your job to go do it. Deal? Listen, whether you learn from me or from someone else, do you agree that you will continue using free content? There is no reason not to continue and every reason for you to do so. You will continue using free content. Do you agree that you want to use it differently, for different results? Again, there is every reason to do so. 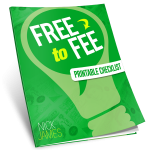 Do you agree that The Free To Fee System is exactly what you need to make this happen? Drumroll please - there is every reason to agree with this. Then, you're going to love what I tell you next! Two Of The Three Payments! You pay only a one-time fee of $97.00 for this course! I'm reluctant to call these "bonuses". I really don't see them as something "extra" to throw in at the end to push you over the edge. Not only will you get the video as a downloadable .mp4 video file (that's right, I don't "force" you to watch it online! ), you will also receive the presentation in a downloadable .mp3 audio file and a downloadable .pdf text file. That is, you'll receive a full, word-by-word, attractively formatted transcript of the entire package. Video, audio and text. Learn however you choose! This isn't just "thrown in". It's an invaluable process tool. You definitely will want to print it out and follow along to stay on track. It will make things so much easier having it at your side as you quickly make your way through the system. I use checklists myself - all the time! Because this is such a highly detailed, intensive training presentation I decided to create a "quickstart" manual. You know the drill, they usually come with electronic products and are a simple introductory guide to getting started without reading every detail. They contain the "least you need to know." The training is designed in such a way that you can use the Quickstart manual to begin immediately and then add-in even more from the main training presentation over time. Honestly, the main training has so many ideas you can't use them all at once! 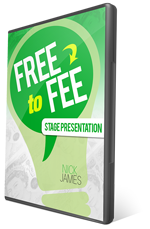 This is the live recording of me on stage making a presentation that I made during a private behind closed doors workshop of a few specially invited guests and presented for 90 minutes from the stage the 'quick version' of the Free to Fee System (this is one of the first things I suggest you watch when you download and open your package). There are three fantastic reports that I'm including in this accessory package that are certain to get your attention: Twenty Ways To Distribute Free Content, Using Social Media To Giveaway Free Content and How To Setup Your Own JV Giveway. Once you have your free content created, these are your go-to resources for actually getting it out into the hands of real people to read/listen/watch your stuff! You will also receive a .pdf of slide "handouts". This is merely what appears on the slide screen, along with lined space to the right of the page for you to take notes as you watch the presentation. Of course, you'll have the entire word-for-word transcript as well. But these handouts are great for taking your own notes, jotting down ideas, etc. In this final accessory, I have assembled a set of twenty ways to get ideas for your next free content piece. This is a swipe file that you will be able to refer to again and again for inspiration. Plus - and this is extremely significant - I've included a very brief case study in this final accessory that will show you an incredibly easy "real life" way to use free content to presell others. This is one of THE best ways that I know of to give away free content that points toward a paid product. And it is, quite possibly, the easiest way to create a "free sample" for others to snack on. Just To Make Sure Everything Is Crystal Clear And You Don't Get "Stuck", I'm Adding Personal Coaching To Your Order! You read that correctly. I'm going to include personal coaching with your order of The Free To Fee System today. While the training is crystal clear and I think your chances of needing help are hovering around the zero percentile, I'm going to make absolutely certain. I normally charge up to $497 for a week of email coaching. That includes five questions asked sent to me by email which I answer back by email. When I tell you that I'm adding in three email coaching questions to your order today this is no small thing! This opportunity to ask me questions about creating your free content is worth every bit as much as you'll pay for the entire package. This is real, one-on-one, personal coaching. You ask me a question and I answer it. There aren't too many other well known internet marketers who are offering this kind of ACCESS! If you get "stuck" and need help, I'm here to help! Questions must be related to the training presentation (no "off topic" emails), used within 30 days and reasonably answerable (IE Don't ask me "what are 25 things I should write about in section 3"? If you come back tomorrow and it's not here, please don't ask me to include it. If I start getting too many people asking questions, I'll have to shut this down. I will, of course, honor coaching for everyone who has already purchased. The highly-detailed, two-hour training presentation video sharing how to profit from free content. The seven value-added accessories that enhance the training leaving nothing for you to figure out. The personal coaching with a 14-year veteran internet marketer who knows what he's talking about. P.S. Why are you looking down here? The order button is up there. Get your copy and put your free content to work for you right away! © 2015 Nick James - eShowcase, Inc.